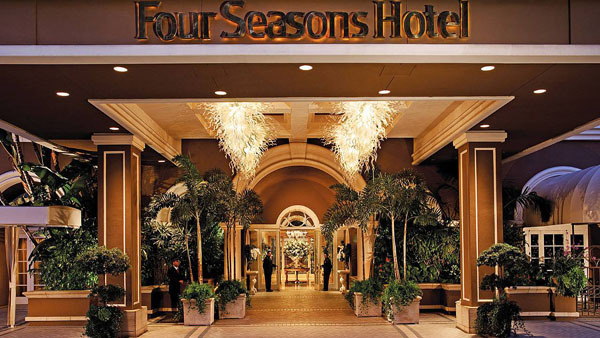 Four Seasons Hotel Los Angeles at Beverly Hills Hotel has looked long and hard beyond its provision of service and comfort to offer their guests the chance to make holistic lifestyle changes through its new wellness rooms and suites. Designed from the ground up using certified experts in the field of health & wellness, these new suites aim to maximize your experience at the hotel and minimize the impact that modern travel places on the body and mind. Firstly, the Wellness rooms are located physically close to the spa, swimming pool and fitness centers which aims to focus the mind of the guest on the facilities being at their close disposal. Working with wellness expert Delos, the suites have a number of unique features which all aim to benefit the body including air purification systems, hypoallergenic wooden flooring, circadian lighting, water filtration systems and de-chlorinator for the shower, eco friendly bath amenities by LATHER and a cleaning protocol involving the use of a UV cleaning tool to neutralize bacteria daily by housekeeping staff. 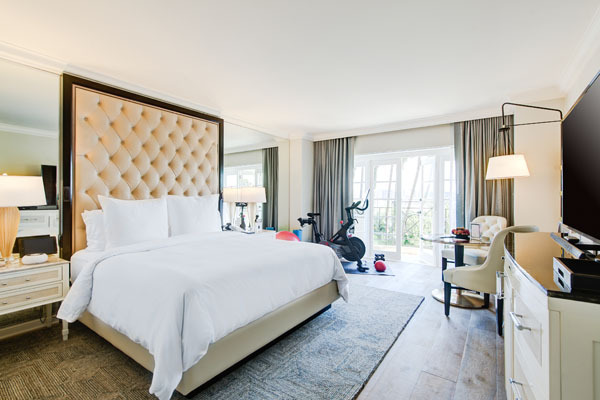 Exercise options include in-room yoga equipment including an Alo Yoga mat, weights, and medicine ball. Wellness suites have equipment available by Peloton should you wish to pursue your exercise routine in private. The mind is also fully catered to by the wellness room experience, a welcome message and guided meditation program by Deepak Chopra is provided through the television to help guests relax and the room enables access to the Jiyo app created by Deepak which aims to engage the user through videos and articles to consider their daily regime. A further element of the wellness experience is complimentary access to the Go!Well program created by the world-renowned Cleveland Clinic. The Go!Well program uses online tools to guide thinking as to sleep, stress management and the importance of nutrition. Leaving the wellness room, the guest is close to the open air swimming pool, spa and fitness centers which offer a wider selection of ways to engage with your health and general well-being. 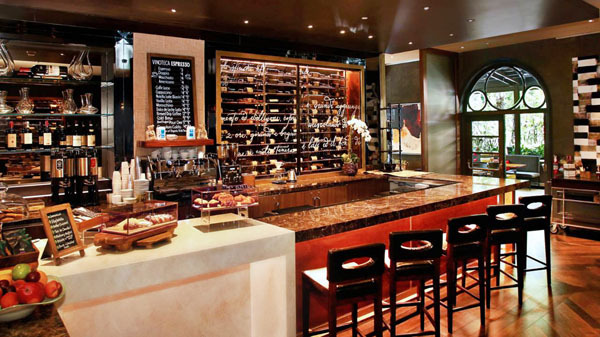 One further element of this unique program is the addition of a juice bar in the Vinoteca restaurant from Kimberly Snyder, nutritionist, entrepreneur and the multi-time New York Times best-selling author of The Beauty Detox series and Radical Beauty co-authored with Deepak Chopra Kimberly has designed a detoxifying juice menu, which includes the Power Green with kale, parsley, cucumber, celery and lemon; Glowing Green Juice with cucumber, celery, kale, parsley, lemon and apple; Detoxifier with pineapple, cucumber and mint; and Clean Red with beets, apple and ginger. Smoothies available include her signature Glowing Green Smoothie with seasonal greens, apple, pear, banana and lemon; Youth Fountain with mango, lime, mint, stevia and coconut water; Power Protein with raw protein powder, pre-hydrated chia seeds, banana, stevia and almond milk,Yogi with spinach, banana, almond butter, dates, vanilla, and almond milk, and Goji Fruit with Goji berries strawberries, banana, coconut nectar and coconut water. “We are excited to partner with Celebrity Nutritionist Kimberly Snyder, who has such integrity and authenticity in the Wellness world, which truly resonates with her clients and fans,” said General Manager Michael Newcombe.